Home (All Topics) → Travel → Canada → Visit the Potato Museum on Prince Edward Island; Then Try Chocolate Potato Cake! Visit the Potato Museum on Prince Edward Island; Then Try Chocolate Potato Cake! By	Matthew Sloane. Last edited by Marios Alexandrou. Until I saw chocolate potato cake on a hotel menu while visiting Prince Edward Island, I'd never heard of such a dessert, much less tasted it. But after savoring the moist and somewhat nubby cake topped with a hard chocolate glaze, I had to know what in the world inspired such a delicious dessert. And locals soon pointed me in the direction of O'Leary and the PEI Potato Museum, home of the world's largest collection of potato artifacts. Turns out that Prince Edward Island is quite the potato producer; farmers here harvest some 2.8 billion pounds annually! As a result, folks here give the humble spud the royal treatment, as evidenced by this museum. 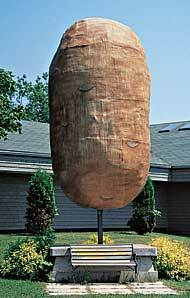 It's an eye-catcher, all right, set among historic buildings and, yes, a 14-foot-tall potato (above). But to get the scoop, go inside. I learned that potatoes took the long route here. First, the ancient Incas introduced them to Spanish conquistadors, who brought them back home from South America. Then British settlers brought them across the Atlantic Ocean to this Maritime Province in 1771. I learned all kinds of odd potato folklore at the museum. For instance, Russians once refused to eat them, denouncing potatoes as “devil's apples”. I also learned about how much nutrition potatoes pack–did you know an average spud contains only 90 calories and as much Vitamin C as a glass of tomato juice? In July and August, the museum often offers such unlikely delicacies as potato fudge and baked potato dogs. And in July, the whole community celebrates spuds at the Potato Blossom Festival. You might say this fun museum, which truly puts the potato on a pedestal, really opened my eyes to the wonders of the lowly spud! O'Leary is on Highway 142 in western Prince Edward Island, about 55 miles northwest of the Confederation Bridge that links the island to New Brunswick. The Prince Edward Island Potato Museum ( 1 Heritage Lane) is open 9 a.m. to 5 p.m. Monday through Saturday and 1-5 p.m. Sunday from May 15 to October 15. For more information, call 1-902-859-2039 or log on to their website. The Potato Blossom Festival runs the last week in July. The scenic North Cape, about 30 miles north of O'Leary at the end of Highway 12, boasts the gigantic windmills of the Atlantic Wind Test Site and nature trails. The North Cape Complex museum, restaurant and welcome center are open 10 a.m. to 6 p.m. daily from mid-May through mid-October; longer hours in summer. For additional details, telephone 1-902-882-2991 during the tourist season or browse their website.